Tip of the Week: Bronchitis – Treat until you’re well? Say you have a bad cold. It’s gone to your chest and now you’re coughing up green gunk. It’s also starting to hurt when you cough and you’re a little short of breath. 1. How long should you use an antibiotic? 2. How do you decide how long is long enough? If you plan on treating yourself or others when no doctor is available, you definitely need an answer to this question. Bronchitis is a condition where, if you treat until the cough is gone, you could well use up a month’s supply of antibiotics – most likely unnecessarily. In an uncomplicated situation (an otherwise healthy individual who has no more than the above symptoms), the correct answer is zero days. No antibiotic is needed. The cough may last three weeks, and this period is not reduced by the use of antibiotics. Yes, I know, your doctor probably has given you antibiotics for this same condition. Doctors are often too chicken not to. But it’s the truth! And if antibiotics are prescribed, patients often call back when the first course of treatment is completed reporting that they are not yet well (naturally), and thus they request a second round of antibiotics, after which they usually have recovered (naturally). Chest colds are usually caused by viruses, and as you’ve heard a hundred times, antibiotics don’t cure a virus. The answer is somewhat different for complicated patients, i.e. those with smoking-related COPD, asthma, congestive heart failure, cystic fibrosis, and other serious underlying diseases. These patients should usually be treated for 5 days, occasionally longer. However, you can’t really use cessation of cough as a criterion for discontinuing the antibiotic. The cough may linger for weeks. Look at the whole picture: if the patient seems to have turned the corner, the antibiotics may be safely discontinued. Pneumonia is another question yet. Fever, rapid breathing, a “toxic” (very sick) appearance, and rapid heart rate make pneumonia more likely (which usually does require antibiotics). 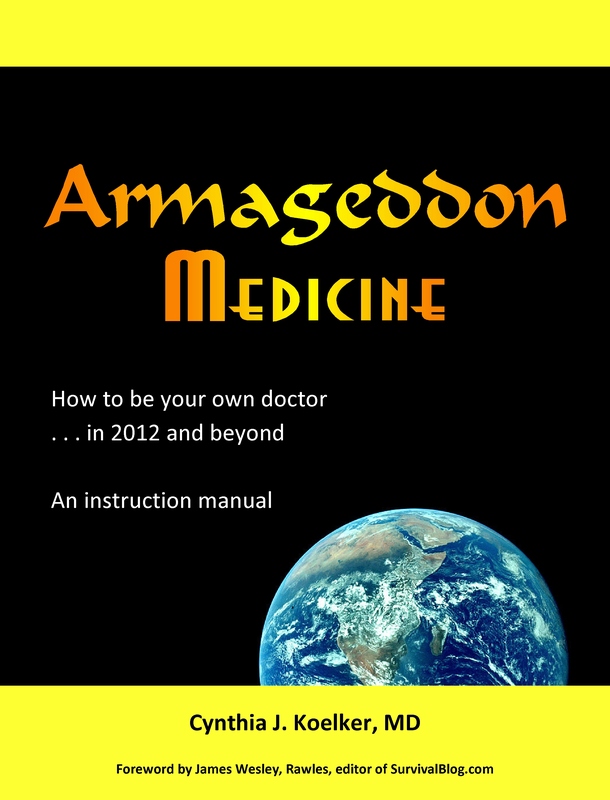 This is where diagnostic skills are essential, as discussed at length in the textbook, Armageddon Medicine. So if not antibiotics, then what? Treatment is largely symptomatic, aimed at decreasing the cough, especially if it disrupts sleep. Dextromethorphan and narcotics are effective (in patients 6 years and older). Inhalers such as albuterol (or Primatene Mist) help those who are wheezing, as may caffeine, inhaled corticosteroids, and sometimes oral steroids. As for herbal treatments, dark honey, echinacea, and pelargonium (kalwerbossie, South African geranium, rabassam) offer modest benefit (which, therefore, would be as good or better than antibiotic treatment in the otherwise healthy patient with bronchitis). Stocking antibiotics is essential, but use them wisely, preferably for life-threatening conditions. Image above depicts a child with pertussis. Adults may be susceptible, so update your immunity with a Tdap vaccine (updated tetanus shot) today. For a good review on the treatment of bronchitis, read Diagnosis and Treatment of Bronchitis, by CLICKING HERE. This entry was posted in Antibiotics, Cough, Medical archives, Slide show, Wheeze. Bookmark the permalink. 3 Responses to Tip of the Week: Bronchitis – Treat until you’re well? As a son of two generations of smokers who expired from Cor Pulmonale due to COPD and who myself was a smoker until 1985, I have one period of annual combat with chronic bronchitis that will last for months. My FP doc usually treats me with 5 day antibiotics primarily since I have had “walking pneumonia” and adolescent asthma (and familial history noted above) Combivent, and Tussin, a remarkable narcotic cough medicine that is wonderful in more ways than one, but I digress. This past year I had to have two regimens of antibiotics since my chest X-ray still showed some peripheral consolidation in my lung fields. I also have had the pneumonia vaccine and suggest it to those who have a propensity for pneumonia when they get colds. I wonder, since I had a history of asthma as a child, that whether or not it has some affect on my annual bouts of bronchitis? Also, I hear that beta-blockers have a negative pulmonary effect and wonder if that may cause increased bronchitis? I ordered your book and am a little pissed that I didn’t get mine signed. But I’ll forgive you this time! Great job and a great site! I am a 68 year old male. For over 20 years I would get pneumonia every year, occasionally twice a year. It was worse every year, sometimes keeping me bedridden for a month, with at least another month of an uphill fight to get back to normal. Then a doctor discovered a grapefruit sized tumor/cancer in my chest which had mostly closed the respiratory passage into my lower right lobe. After a lobectomy to remove that lobe (which also had cancer in it). I have had bronchitis (not pneumonia) this year for the first time in 7 years (since the operation). During those 7 years I have not even had a cold. In other words, I had a physical occlusion that created a near perfect petri dish for bacteria to grow, such that even antibiotics were ineffective (yes, a sputum test showed it was typically bacterial pneumonia). The point is that once this was fixed, I didn’t get sick for seven years. It does make me wonder if people who are sick all the time might have some kind of physical blockage in their lungs that allows for a trapped bacterial “farm” that keeps them sick in spite of treatment. I might add that x-rays when I was sick merely showed the expected pneumonia and it was an x-ray when I was healthy that made the doctor suspicious that something else was going on. A CT scan showed this enormous tumor in all it’s glory while the X-ray merely looked “cloudy”. GWTW makes an excellent point about the value of a CT scan for recurrent pneumonia. A tumor can easily “hide” amidst a pneumonia – I’ve had several patients who’ve had a similar problem. In fact, especially for a smoker, anyone who gets pneumonia “out of the blue” should be re-evaluated when well, either with a repeat CXR or a CT scan. A grapefruit-size tumor should show up on a simple CXR (chest X-ray) if not obscured by pneumonia. There is no strict standard of care for a follow-up X-ray after pneumonia. Doctors often skip this step, to avoid inconveniencing the patient. Certainly if you don’t feel 100% back to normal by a few weeks you should request a repeat CXR or CT.
Glad to hear you’re healed, GWTW. Thanks for sharing.